With little government oversight or public outcry, the multibillion-dollar youth marketing industry has transformed American children into one of the most powerful and profitable consumer demographics in the world. 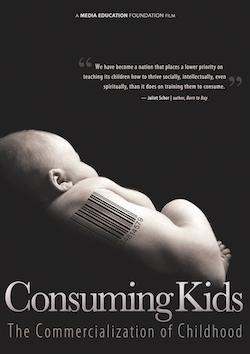 Consuming Kids examines the effects of advertising on the health and well-being of kids and their parents, and gives an inside look at the relentless marketing machine behind it. Hiershenee Bhana is a health promotion specialist with experience developing and evaluating nutrition education curricula and health-promotion programs for schools, worksites, and communities. She is a doctoral candidate at Teachers College, Columbia University, currently completing her PhD. For her doctoral dissertation, Hiershenee developed and evaluated the In Defense of Food (IDOF) curriculum, available on Public Broadcasting Service (PBS), as the companion to the IDOF documentary film and based on the work of best-selling author Michael Pollan. She has experience developing cultures of health by creating programs which both motivate individuals to engage in healthy behaviors and change the environment to make it easy to do so. Hiershenee formerly worked in the area of maternal and child health, chronic diet-related disease prevention, and with HIV/AIDS patients, serving vulnerable communities in the tristate area. She is currently working at Columbia University’s Mailman School of Public Health and consults for a non-profit think tank and planning group in New York City. Dr. Feigelson has been in private practice as a psychiatrist for many years treating children, adolescents, and adults. She has worked as a school consultant throughout Westchester County and New York City. For her entire professional life she has endeavored to improve the emotional and psychological well-being of children. She has a special interest in the influence of culture on development. Her experience with mental health in educational settings has promoted dialogues with kids, parents, educators and community members about how to raise healthy resilient kids. My name is Rachel Carvajal and I am a Bilingual School Psychologist for the City of New York Department of Education. I currently work in the Bronx servicing two schools, a middle school and a middle through high school. I received my masters degree at Fordham University and I have been living in New York City for 6 years. I am fully Bilingual speaking both English and Spanish fluently. I’m entering the fourth year as a school psychologist and I am very passionate about what I do!